With Meicoomon lost somewhere in the distortion between worlds, a heartbroken Meiko has started keeping her distance from her new Digidestined friends. Seeing them all smile with their healthy Digimon partners has simply become too painful, but there's another reason she's reticent to spend any time with the group, and Izzy has begun to piece together that horrible truth. While he works himself to exhaustion to figure out what's causing all these distortions, the other Digimon begin to grow restless in quarantine, wondering what good being "safe" will really do if infection continues to spread throughout the net and threaten human society in their place. Meanwhile, Himekawa is busy at work on her own scheme, researching a contingency plan called "Reboot" that may be able to repair the rift between worlds at a great cost to the Digidestined. But when T.K. is the first to discover just how badly they've all run out of time, he finds himself at a complete loss, splintering the group further and forcing Patamon to spur the other Digimon to action in their partners' place. Who will pay the ultimate price for peace in the Digital and Human worlds, and will the kids be able to handle their new reality when it's all over? Growing up can be wonderful in many ways, but so far, Digimon Tri has just been exploring all the not-so-wonderful things about it. From Tai's realization that the war games he used to play as a child have permanent real-world consequences, to Joe's struggle to reconcile the pressures of adulthood with his desire to join his younger friends in nostalgic adventuring, the first two Tri movies (or first eight episodes on Crunchyroll) didn't hesitate to inject more mature ideas into a children's franchise that had unexpectedly grown up alongside its audience. However, these thoughtful digressions from the previous films are like bottle rockets compared to the bombshell that this third movie drops on its fans. Just as both of those characters have started to move past their issues, the permanent consequences Tai feared and the adulthood emotions Joe struggled with ramp up to a shocking breaking point that affects all nine Digidestined and their partners. Tri. - Kokuhaku turns dark and gloomy right from the start, as Meiko pulls away from the group out of guilt over what happened to Meicoomon, and the two hours to follow become an unexpectedly grueling therapy session for the entire cast and the blindsided adult Digimon fans watching them suffer. If Tri's flirtation with adult emotions was all fun and games in the first two movies, Kokuhaku (Confession) blurts out this series' true intentions in ways that can never be taken back. As the Adventure cast all cross the threshold of adolescence, this movie becomes a eulogy for their childhood, which is a turn I don't think Digimon fans were prepared for. 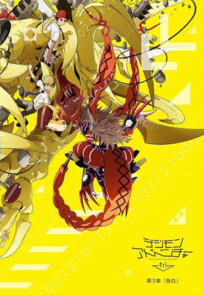 While there are any number of ways to characterize the shift from childhood to adulthood, Tri chooses to explore a "Tree of Knowledge" metaphor with the Digidestined, where adulthood brings the necessity of lying, slowly building a wall between the emotions you feel and the emotions you share as you encounter problems with no answers for the first time and choose whether or not to burden others with them. Himekawa, who is fast becoming Tri's (probably misunderstood) villain, foreshadows this theme with her choice to hide Ken Ichijouji's disappearance from Matt. When Nishijima goes off on her for lying, she responds that some things are better off not knowing, but it doesn't matter because Izzy will still figure it all out soon enough. Even when the adults hide things from the teens to protect them, they can't stop our heroes from growing up and facing the uncertainty and compromise of the adult world. Everyone's childhood changes and even dies a little as they age, forcing even frozen memories to take on new perspectives. Unfortunately for the Digidestined, that childhood is represented by their Digimon, and what better way to drive a stake right through the audience's hearts than by making the most childlike partner, Patamon, the first victim of a deadly infection? Izzy's place as focal character for this movie already makes sense given the burden-of-knowledge theme, but as the group babies, T.K. (and Kari) have always been the least developed members of the Adventure cast. So putting T.K. in the spotlight as a kid suddenly overburdened by adult emotions is an inspired and heartbreaking choice. (Kari's day will come eventually, but at least her role as vessel-for-the-DigiGods makes a clever comeback this time.) T.K. is the first to face a dilemma that all the characters must confront in their own ways as the movie progresses. How do you ask someone for help to a problem that you're afraid can't be solved? When is it a mistake to share the truth, not just because the listener might not be able to handle it, but because you're not emotionally prepared to deliver it in the right way? Should you just hide it and hope you can shoulder the pain? Is that the more childish or more adult thing to do? As T.K. discovers when he does the wrong thing both by telling Meiko the truth and by hiding that truth from Matt, there's no clear answer. That awful moment when you first begin to fear the gap between your true feelings and the feelings you share with the world, either because it will hurt others or hurt yourself, slowly turns childhood into adulthood. Adolescence is a change that everyone goes through kicking and screaming because it can never be reversed, just as the Digidestined face the reality of losing their Digimon to protect their world. Izzy curses his childishness for not being able to solve the problem, while T.K. curses his childishness for trying to act like the problem doesn't exist, but they're both stuck in the same rut of being unable to accept changes that are out of their control. At least the beauty of change is that they won't be stuck there forever. As Tentomon reminds them, "Knowing nothing just means you have the chance to learn new things, right?" It should come as no surprise that all this navel-gazing about the inevitability of things coming to an end, while powerful in a positive way, is just brutally sad to watch. The only pure moment of levity in this entire arc comes from the uplifting opening theme (the new closing theme is super-melancholy), but even that hopeful ballad has been turned into a tearjerker in light of singer Koji Wada's recent passing. Of course, if the whole movie were wistful philosophizing and melodramatic plot twists, it wouldn't have anywhere near the sledgehammer effect it achieves with its complete focus on natural character development and interactions instead. While the first movie's unconvincing inner conflict for Taichi was a significant speedbump (the idea was fine, but the execution was uneven), all the character writing in Digimon Tri since then has been almost freakishly spot-on to the spirit of the cast, capturing their personalities perfectly and aging their quirks up with grace. This movie is no exception, and even with Izzy and T.K. as the focus characters, everyone in the cast (both human and monster) gets ample room to shine, as they all react to the tragedy in their own unique ways and rebound off one another with beautiful chemistry. Series scriptwriter Yuuko Kakihara may not have any history writing for Digimon before this, but she understands the spirit of its world and characters to an uncanny degree. All this pathos and mystery is executed with production values significantly improved from the first and second movies, but that's probably because Kokuhaku contains even less action than either of its predecessors. There's only one action scene in the whole movie, and while it is a doozy, it's also the only time the movie struggles to stay on-model, devolving into embarrassing jerky animation pretty fast. For all the heart-rending character moments before and after, the art stays in good enough shape not to be distracting, with a few fleeting moments of visual splendor. The Tri movies have only continued to look and sound better as they've progressed, so with any luck, the production is finding its feet as the writing gets exponentially better every time too. After this movie's adventure reaches its inevitable conclusion, Tai urges his friends to embrace the next chapter of their journey with a half-joking "If we wait around for 'someday,' we'll end up becoming adults!" It's a funny thing for him to say considering their new mission, but the secret strength of Tri, especially in this movie, has been watching the kids that Digimon fans grew up with stumble their way into adulthood with relatable tenderness and honesty. They've already grown up a lot, and as their relationships toward their partners change from playmates to parents, it'll be fascinating to see where this introspective final chapter in Adventure takes them. It somehow ends on an even more punishing cliffhanger than the previous film did, so if you've been holding out on giving Digimon Adventure a shot, now's the perfect time to catch up. Tri has turned it into one of the only kids' anime that's only gotten better with age.